We’d love your help. Let us know what’s wrong with this preview of Rock Star Romance by Ruby Hill. The only reason I agreed to th Why did I ever agree to a fake engagement to this jerk? To ask other readers questions about Rock Star Romance, please sign up. The books included in this set are: Fake Marriage to a Rock Star, Country Star’s Bodyguard, Rock Star’s Nanny, and The Rainforest’s Song. Dressed in rhinestone cowboy boots, Fiona Walsh, country superstar, grabbed a black cowboy hat and pushed it on her head, much to her hairdresser’s dismay! With a smile and a thank you, she headed toward the stage. She had been singing for 11 years now and her fans loved her! Fiona sang a new song for The books included in this set are: Fake Marriage to a Rock Star, Country Star’s Bodyguard, Rock Star’s Nanny, and The Rainforest’s Song. Fiona sang a new song for them that night, one written for the city of Phoenix especially. Singing it with all her heartfelt feelings, the song raised her up, and much later tonight, she would crash back down with no one to hold her, love her, and comfort her. Nobody realized that this song was actually real, and how torn apart she was. When her new bodyguard, Rocco De Luca enters her life, he sees the real Fiona and she pushes back to keep him away. Can this honorable, special man get through to her before he has to walk away from his own feelings? Can he heal her so that both can find love? Fake Marriage to a Rock Star is a clean, interesting, romance. Brendan, lead singer for his band, is spread across the tabloids as a home wrecker. He needs some damage control - and fast. Enter Ava, younger sister to Brendan's best friend. The plot to clear Brendan's name is using Ava as a fake fiance. The story is well written, with a few surprising twists. The characters are well done as well. I spend a happy few hours involved in this drama. Country Star's Bodyguard is a sweet, clean romance. Fake Marriage to a Rock Star is a clean, interesting, romance. Brendan, lead singer for his band, is spread across the tabloids as a home wrecker. He needs some damage control - and fast. Enter Ava, younger sister to Brendan's best friend. The plot to clear Brendan's name is using Ava as a fake fiance. The story is well written, with a few surprising twists. The characters are well done as well. I spend a happy few hours involved in this drama. Country Star's Bodyguard is a sweet, clean romance. I really appreciated Fiona's humility and humanity. Rocco was a consummate professional who made plans to step down as her bodyguard as soon as he realized he was falling for Fiona. This book had a lot of real character development. This story just really resonated with me and I could not put it down. I received this collection with the understanding that I could leave a voluntary and honest review. In this collection we get 4 amazing stories. Each of them give us stories about men and women who desire someone they shouldn't but learn to fight for what they truly want. Each of these stories have the couples going through something that alone they won't make it together they can fight anything. The thing they each have to decide is what are they willing to risk to make this happen. Will they a I received this collection with the understanding that I could leave a voluntary and honest review. In this collection we get 4 amazing stories. Each of them give us stories about men and women who desire someone they shouldn't but learn to fight for what they truly want. Each of these stories have the couples going through something that alone they won't make it together they can fight anything. The thing they each have to decide is what are they willing to risk to make this happen. Will they all find their HEA or will something or someone stop them? This is a great collection of Rock Star Romances that are sweet, well written love stories with well developed characters. This is an entertaining, sweet romance between a rock star and his best friend's sister. Ava had a crush on Brendan growing up and now Bren wants her to be his fake fiance so he can fix his tarnished reputation. This is a well written story with good characters and an HEA. Fiona is a country star and Rocco her bodyguard. This is a great collection of Rock Star Romances that are sweet, well written love stories with well developed characters. Fiona is a country star and Rocco her bodyguard. I like that even though the attraction was their the authors didn't rush their love story. The characters are believable and the story heartwarming. A good afternoon read. Brendan and Ava have been friends since childhood so when he needs a fake fiancee she agrees. But oh what happens next is so special!!!! When Fiona meets her new bodyguard Rocco sparks fly and not the romantic kind. Thrown into difficult situations they learn that first impressions are not always right. Ryder was a self serving rock star until he becomes a father to his five month old daughter when her mom is killed. Olivia becomes her nanny and his life will never be the same!!!! Wow!!! This story is full of surprises and adventure. So, Brendan and Ava's story I had read, Fiona and Rocco's story I had read, both I really enjoyed. Ryder and Olivia, that was such an awesome story, I loved the development of Ryder's character, he turned out to be really awesome. Emma and Diego too cute and the curve ball about Diego, I was actually stunned by that, definitely not what I was expecting at all. I hope you have a story ready for Celeste...you can't leave her alone, I can't wait to see what you do for her. I must mention how well y So, Brendan and Ava's story I had read, Fiona and Rocco's story I had read, both I really enjoyed. Ryder and Olivia, that was such an awesome story, I loved the development of Ryder's character, he turned out to be really awesome. Emma and Diego too cute and the curve ball about Diego, I was actually stunned by that, definitely not what I was expecting at all. I hope you have a story ready for Celeste...you can't leave her alone, I can't wait to see what you do for her. I must mention how well you tied all their stories together, such a great job! Of course they all ended just the way I like them. HAPPILY EVER AFTER! Great job, Ruby! Fake Marriage to a Rock Star: Ava’s and Brendan’s story. Country Star’s Bodyguard: Fiona’s and Rocco’s story. Rock Star’s Nanny: Olivia’s and Ryder’s story. The Rainforest’s Song: Emma’s and Diego’s story. 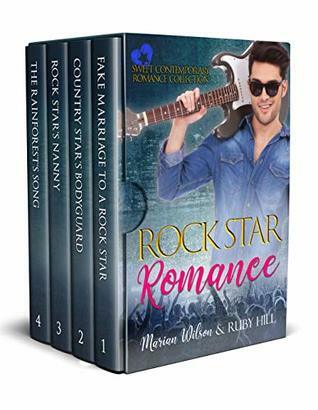 This contemporary rock star romance collection had four sweet and tender romances with captivating characters and well-written stories that kept me entertained and engaged from beginning to end. I enjoyed all of the books and this box set is a must-read for anyone who loves beautifully written clean romances. I received an advance reader copy of this book from Booksprout and this is my voluntary review. easy to read and you could tell what was going to happen. There really wasn't any surprises. This book was part of a series. All the books had good chemistry between the characters. Ruby Hill is a gifted writer. This was an awesome collection of Rock Star romances. Included in this series is: Fake Marriage to a Rockstar, Country Stars Bodyguard, Rock Star Nanny and The Rainforests Song. I had already a couple of the stories but I enjoyed reading them again. This was the perfect collection for a lazy weekend. Definitely recommend. 5 stars! These stories are a group of cute romances featuring a different Rockstar finding true love scenarios. I love that they included different kind of rock stars and a variety of story lines. I enjoyed the different stories and the different ways they get to their happy ever afters. 4 Different Romances all with HEA's! Each of these books has their own plot and twists and turns. Some have impossible odds or problems that seem insurmountable. This collection will give you hours of reading pleasure! A four book box set of music star themed romances. Hours of reading pleasure. Included are Fake Marriage to a Rock Star, Country Star’s Bodyguard, Rock Star’s Nanny and The Rainforest’s Song. Likable characters and entertaining, steamy stories. I read a reading copy via Booksprout and voluntarily chose to write a review. First of all, they are sweet romance stories of 4 famous singers which I enjoy reading but also get bore. I give this series 4 stars because even if they are sweet, I also want more details in each stories. While I was reading them, I kept thinking that I'm missing something. It's so annoying. Good story lines about rock stars finding love. Ruby Hill writes fantastic stories that will hold your interest to the end. The 4 stories in this book are sweet and sure to warm your heart. Each story has memorable characters and storylines. Each will bring a smile to your face and maybe even a chuckle or two. Read and enjoy! A very fun collection of romances. These four Rockstar themed romances provide entertaining storylines, likable characters, good chemistry and a good level of emotions. A very good set of reads. This is my freely posted, frank review. These four young adult romances centered on the music industry each take about a day to read and consider how to tell true love from its imitators. I really enjoyed reading this boxset or rockstar's romance. Each story has a great storyline and characters with chemistry that is smoking hot. Also each one has a hea. This is a boxset that will be read again in the future and worth the money. This series was fun to read. The individual books in the set were exciting and interesting yet kept you entertained enough to finish. I enjoyed reading these books. This box set of four sweet romances is really great. All four are enjoyable and worth the read. If you are looking for a little rock star romance, check out this boxed set! I enjoyed Ava & Brendan's story. This was a fun book. I'm voluntarily leaving an honest review for a copy of the book via booksprout. This was a great box set. The stories, although short, were pretty good.